I hadn't seen Emmanuel in 2 years, and he knows the Cols of the region very well. 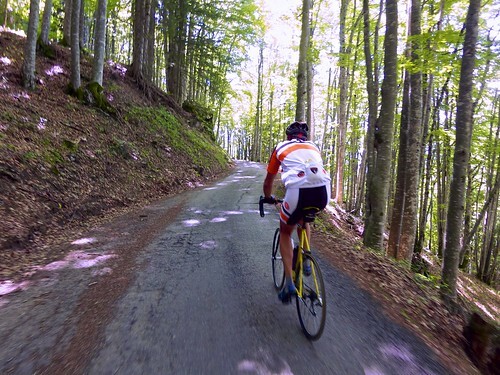 My challenge was to find a climb from Annecy that he hadn't cycled that would make him go "wow!" Success. My old friend Emmanuel is vacationing in Annecy with his family. I hadn’t seen him in 2 years, and he knows the Cols of the region very well. 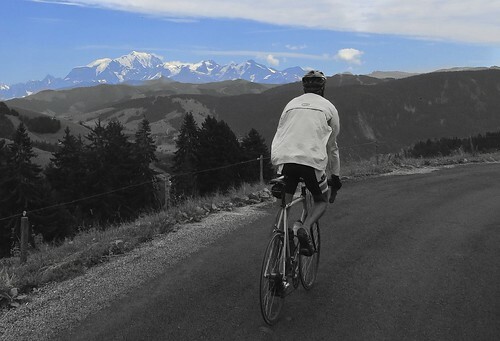 My challenge was to find a climb from Annecy that he hadn’t cycled that would make him go “wow!” Success. 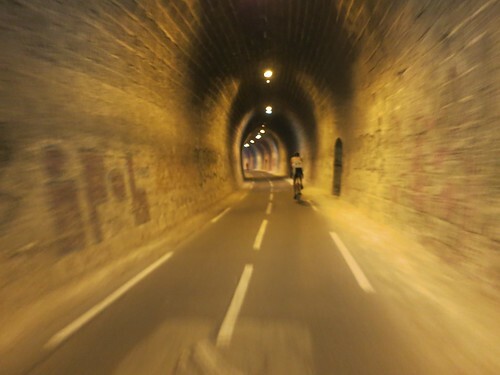 This is a great loop, with much of the riding on the Annecy Bike Path. It’s a perfect place to ride side-by-side and chat without worrying about cars. 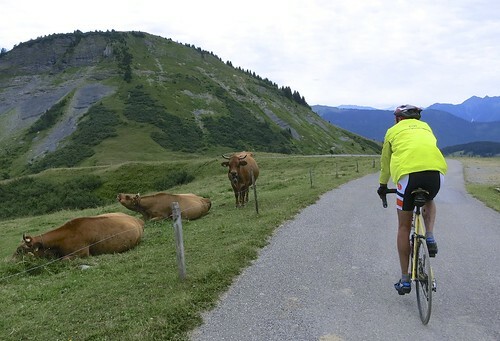 Approaching Ugine, there are several turns off the bike path to join the “route des montagnes” up to Col de l’Arpettaz. I love this climb – look at the map above – hairpins galore on a quiet road that is partly pasture land and partly light forest. 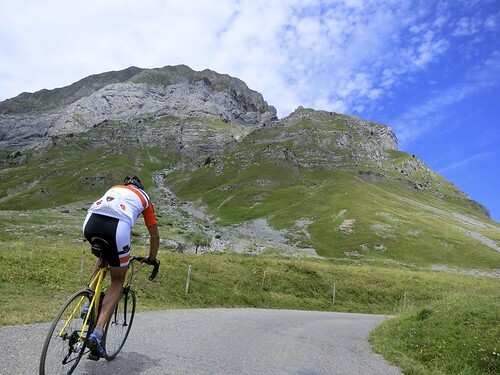 For a truly superb mountain bike adventure, there is a gravel road that links Col de l’Arpettaz with Col des Aravis. Details here. Merci mille fois to the family of Manu for entertaining and feeding me afterwards — and for the great swim. Wonderful day. Thank you my friend ! It was my pleasure too. The food was for the Coke… See you soon ! Did this loop from Annecy yesterday after reading about it here. 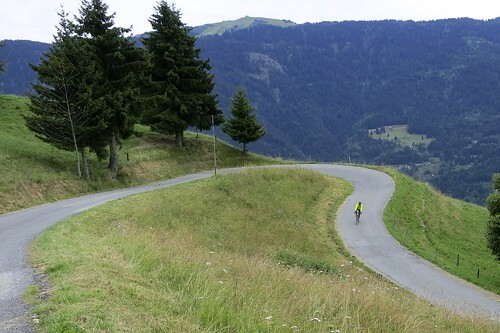 Probably my favourite climb around this area so far, and that includes Forclaz, Semnoz & Colombiere. Even though it is summer I was glad to have warm gear for the descent – and the fire was lit in the refuge thankfully. Descend the Eastern side for endless hairpins all the way to Ugine – climb the western side ( as described in the post) as the road surface is crappy in spots – fine going up, but would make for a slow less enjoyable descent. Road bike with 23mm tyres was fine going this way. About 100km from Annecy return. Great website – best resource out there for first time visitors like me. thanks for the note Paul. 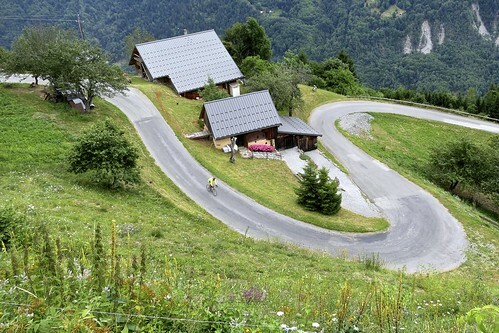 Yes, this is a great climb that gets ignored. And yes, coldest August I can remember. Thank you for creating this wonderful website. 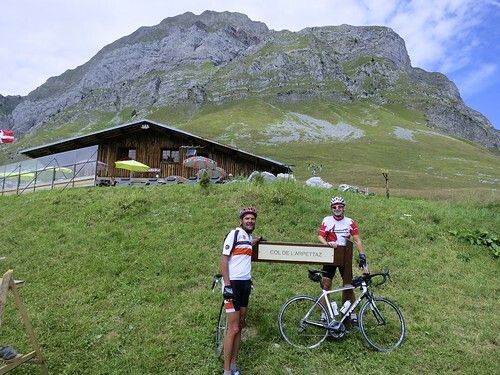 We spent a couple of weeks in Doussard last summer and used your guides for Semnoz, Forclaz, Leschaux and my personal favorite, this one. I completed the first three alone but enjoyed this one in a group of 6. Great coffee at the cafe at the top too! Great info! Going to Lathuile for 2 weeks this Saturday and will be riding this one for sure!